That's a Wrap! 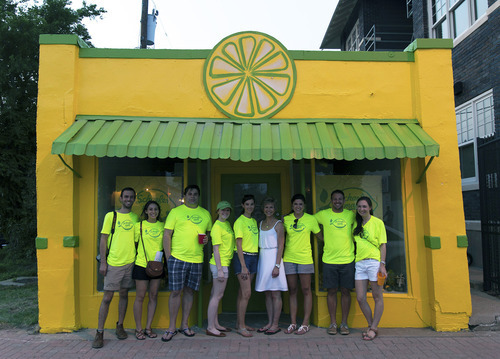 - Schaefer Advertising Co.
A big thank you goes out to everyone who help make Schaefermade Lemonade Co. a sweet success at Arts Goggle last weekend! We gave away 1,250 cups of lemonade and raised $513.33, which will go toward the tree planting initiative in our very own neighborhood. A few lemons will go a long way by beautifying the area for generations to come. Our apologies to anyone who came by after we’d run out of cups. Just be sure to like us on Facebook for news on future events. While the lemonade is long gone, we do still have a few electric-yellow Schaefermade t-shirts left. If you took pictures of the Schaefermade stand (or Mr. Lemon), post them on our Facebook page, tag Schaefer Advertising and we’ll send you a free t-shirt. When life give you lemons, make lemonade. When Schaefermade gives you lemonade, donate money to plant trees. Bet you didn’t know that’s how the rest of that saying went.